Our sport and love of the oceans has given us so much pleasure we owe it to the environment to return the favor. Due to intentional abuse of the oceans and reefs, naturally occurring weather fluctuations and diseases the reefs have suffered varying degree of damage. Reefs, to some degree, can restore themselves if the damage is not to severe. But unfortunately now in many cases it is. With our ability to destroy we have the ability help restore. This is exactly what the Coral Restoration Foundation CRF does. 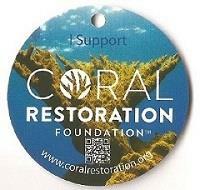 CRF is 100% non profit and uses 100% volunteer divers to do the work of reef restoration. Just recently the parent CRF in Key Largo Florida, where I got my coral restoration diver I certification, received a $2.1mil grant from NOAA!! With my limited ability to present a well written article I will post the links needed to educate as many as I can and to pass on what I have learned and what has added a very fulfilling source of pride to my diving life. Curacao CRF, I just returned from 2 weeks in Curacao and did a dive with there CRF team.